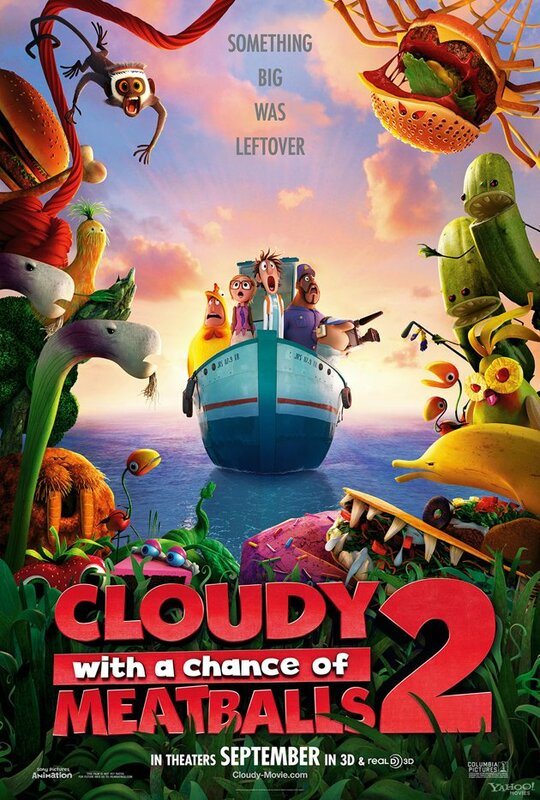 I really enjoyed the first “Cloudy with a chance of Meatballs” back in 2009, so naturally I was looking forward to part two. As far as sequels go, this one is entertaining, brightly colored with more plot than is truly necessary. The movie picks up where the last one left off with inventor Flint Lockwood (voiced by Bill Hader) meeting his hero, the popular TV scientist Chester V (Will Forte). Later on we find out that his “hero” is actually an evil mastermind who is planning to clean up Flint’s food-infested island home for his own benefit. I can’t imagine how challenging it must have been for the Sony Pictures animation team to create a second film all about weird looking creatures without becoming too terrifying for its core audience of kids. Yet somehow they’ve managed to pull it off, and “Cloudy 2″ is full of cleverly designed characters and concepts. Directors Cody Cameron and Kris Pearn, along with their team of writers deserve credit for what they’ve accomplished. At the same time, I wish the movie was funnier and wasn’t so plot-heavy, particularly in the final act. But still, there’s enough here to satisfy, even if you’re way past puberty. I couldn’t watch for more than 30 mins. It was so silly.